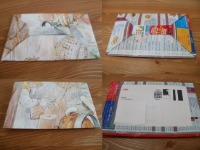 These Origami Instructions Are Great For Recycling Junk Mail And Pizza Leaflets. The idea behind these origami instructions all started a few months ago. I was in the supermarket looking for recycled bin bags and whilst browsing the aisle my eyes settled on compostable bin liners for counter top compost bins and they widened at the price!! Wow, that's a lot of money for some disintegrating bags!!! I have to admit it had been getting on my nerves having to wash out my little compost bin every time I emptied it out into the big one in the garden. An origami cup made from used newspaper that will stand inside your counter top compost bin, where you put your left overs before taking them and putting them in your garden compost heap. When it's full you just fold the top over and it makes a little paper parcel to put into your big compost bin. 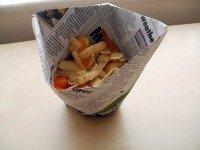 The newspaper absorbs any liquid that the rotting veg or not quite squeezed out tea bags leak, so you no longer have to clean out your little bin every time you empty it. Result - it costs nothing if you already buy newspapers or can get them from someone else and they take less than a minute to make!!! Make a Newspaper Cup to Line Your Counter Top Composter. So I thought why stop there! Ever wondered what you could do with all those pizza leaflets that are deposited through your door on a daily, sometimes hourly, basis. I collected ten in just one week! I normally put them straight into the recycling bin and don't give them a second thought. But I was about to order some recycled origami paper online when I thought - hang on a minute- with a few seconds of preparation I could use some of those leaflets instead of spending any more money. It would also save all the energy that had gone into making the recycled paper product that I was about to buy. I know that it's quite a minimal environmental saving but every little counts eh! 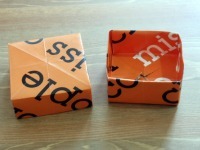 Try making this origami box with lid. It makes a great gift box and can be made from junk mail, pizza leaflets or old books! Use these origami envelopes to send letters through the post or use them to showcase your homemade cards.